Easter Egg Hunts at 11 a.m. and 1 p.m.
Join us for for our annual egg-stravaganza – St. Louis’ largest Pet Easter Egg Hunt! Bunny ears, Easter finery, fancy Easter bonnets welcome, but not required! Fun for the entire family! Sponsored by Solid Gold Pet Nutrition! Thousands of Easter eggs, filled with a treat or prize, will be “hidden” on the lawn for your pet to find. Once the hunt begins, if your dog’s nose touches the egg, it is hers! One GOLDEN EGG will be hidden in each of the three areas (one for small, medium and large pets) to be redeemed for a Giant Easter Basket filled with toys and treats for one lucky pet. When: Saturday, March 24, 11 a.m. and 1 p.m. Registration opens one hour before the hunt begins! Cost: $5 registration fee per pet benefits St Louis English Bulldog Rescue. 100% of your registration fee goes to St. Louis Bulldog Rescue! ** The Easter Egg hunts begin promptly at 11 am and 1 p.m.! ** Register online and trade in your “ticket” for a “basket” at the online registration tent. ** If registering the day of the event, only cash will be accepted. 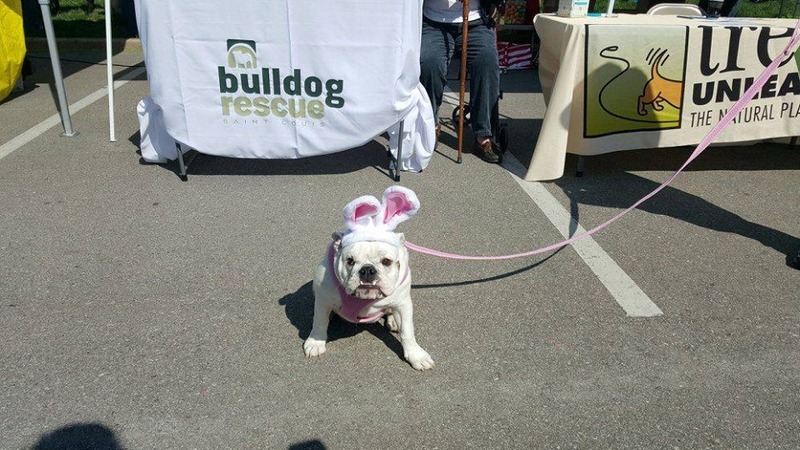 Registration tent opens at 10 a.m. and 12 p.m.
** Have your pets and family’s photo taken with the Easter Bunny. ** Visit with food and treat experts from Solid Gold Pet Nutrition and Treat Planet. ** Donate a can of pet food Bi-State Pet Food Pantry and “Spin the Wheel” for a great prize! ** Please make sure your dog’s vaccinations are up-to-date. No retractable leashes, please.